I won’t bury the lede or attempt to keep you in suspense. With Keaton, Brady, Kendall and Tamie outside Wrigley Field in 2006. This is a no-brainer really: The legendary Wrigley Field — home of the Chicago Cubs — ranks No. 1 on my bucket list of a dozen major-league ballparks I’ve yet to experience. The 101-year-old Wrigley — known for its ivy-covered outfield walls — was built in 1914 and ranks as MLB’s second-oldest ballpark after Boston’s Fenway Park. 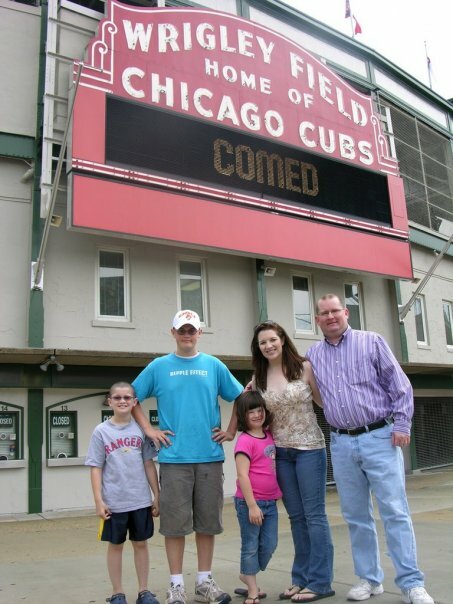 In 2006, my family and I actually visited the outside of Wrigley and posed for a photo under the famous red sign. But the Cubs were out of town, and we did not get to see an actual game. Your turn: Which ballparks are at the top of your bucket list? Tweet me @bobbyross.